Being able to do high-speed PCR, especially in time constrained settings such as STEM education environments, is a key step to make molecular biology accessible and practicable. 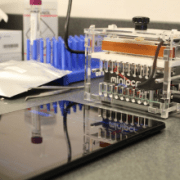 Below we share how the miniPCR™ machine can be used to deliver robust and reproducible PCR results in 24 minutes or less. Polymerase chain reaction (PCR) is the process of amplifying targeted copies of DNA by the billions. From the sound of it, one would think that this should take a long time–just thinking about the amount of DNA produced. In time-constrained settings, such as the classroom, PCR often seems unfathomable, but below we show that it can be done. Fast. We set out to challenge the idea that PCR needs to take one hour or more by first identifying an adequate low-complexity target. Because we wanted this example to be realistic, we aimed to use tiny (low picogram) amounts of plasmid DNA cloned in our own lab. 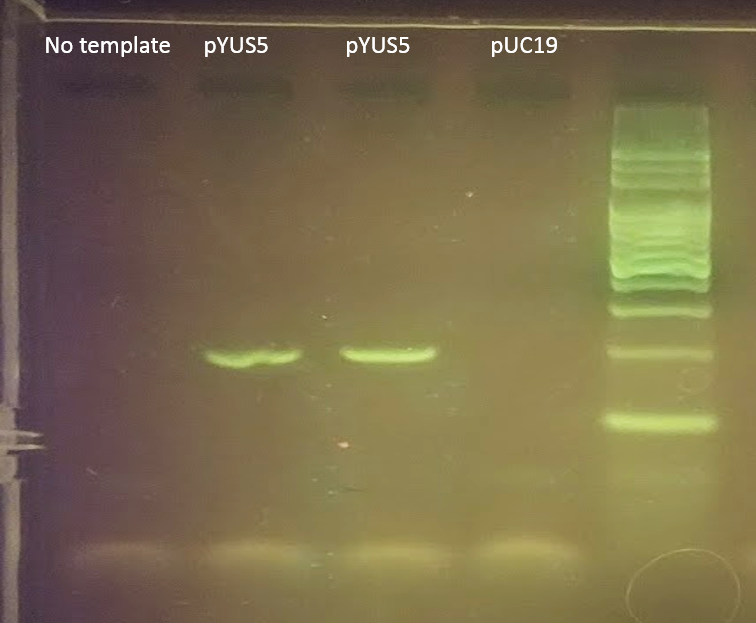 And because we wanted it to be directly classroom-relevant, we settled for pYUS5, a recombinant DNA plasmid carrying endogenous plant tubulin sequences, often used as a positive control in plant transformation experiments. FAST PCR amplification results run on 2.4% agarose gel and detected with Gel Green DNA stain. Lane 1: no template DNA (negative control). Lanes 2, 3: pYUS5 (4 pg). Lane 4: pUC19 (4 pg, negative control). Lane 5: 100 bp DNA ladder. This 24-minute 23-second run yielded robust and reproducible results. Negative controls (no DNA input and a non-target plasmid) yielded no amplification bands, as expected. We hypothesize that further reductions in run time may be possible by further reducing step times (e.g. eliminate initial denaturation and final extension) or by reducing the number of cycles. Additional testing will likely confirm these predictions. Through these trials we can conclude that in a time-constrained environment, PCR can be completed in sub-25 minute time frames using standard reagents available in an educational kit. Several other plasmids and primer combinations could have been used to yield similar results in a classroom setting. 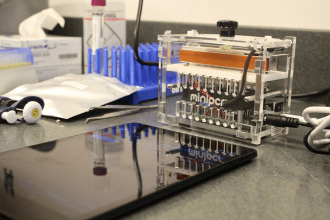 It does not escape our notice that many commercially available PCR machines should also be able to run a successful PCR within a similar time frame, assuming adequate ramp times and comparable heat transfer performance to miniPCR’s small thermal mass sample block. 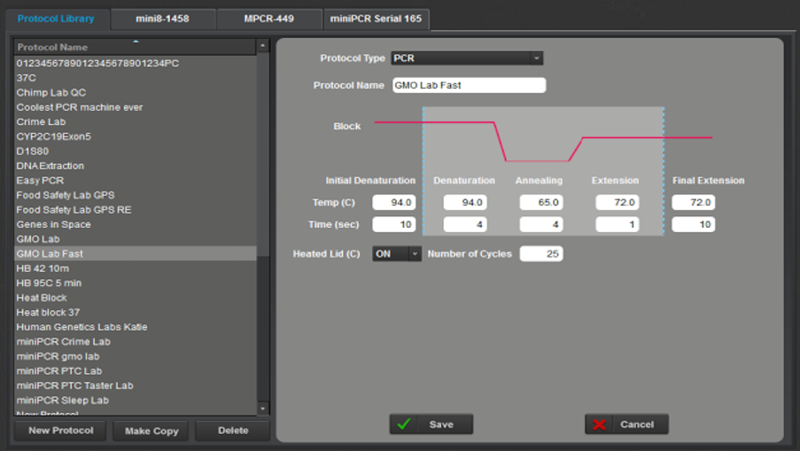 The miniPCR™ machine was developed to make the process of PCR more accessible and practicable. Being able to do high-speed PCR, especially in time constrained settings such as STEM education environments, is a great step in that direction. If you have questions about implementing fast PCR, please contact us.